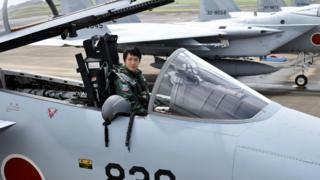 A Japanese woman will be flying through the glass ceiling as she becomes her country’s first female fighter pilot. First Lieutenant Misa Matsushima, 26, will begin duty on Friday having completed her training to fly F-15s, Japan’s military has announced. “As the first female (fighter) pilot, I will open the way,” she told reporters. Japan’s air force began recruiting women in 1993 – except as fighter jet and reconnaissance aircraft pilots. It lifted that final ban in late 2015. “Ever since I saw the movie Top Gun when I was in primary school, I have always admired fighter jet pilots,” the graduate of Japan’s National Defence Academy told journalists. Three other women are currently training to join the elite group of fighter pilots. The F-15J fighter jets they will pilot are twin-engine aircrafts designed for air-to-air combat with other jets. They can reach top speeds of about Mach 2.5 – 2.5 times the speed of sound or about 3,000 km/h (1,864 miles/h). “The first female fighter pilot of the Air Self-Defence Force is born,” a tweet (in Japanese) from the Japan Air Self-Defence Force said. The 26-year-old had planned to fly transport planes before the final gender restriction on fighter pilots was lifted. Japan has high levels of gender inequality, with many women expected to become housewives rather than having a career. But faced with an aging population and shrinking workforce, Prime Minister Shinzo Abe pledged in 2013 to empower working women. The armed forces has taken on his “womenomics” policy by planning to increase the number of women serving in the 228,000-strong air, sea and ground troops from the current 6.1% to 9% by 2030. Earlier this year, Ryoko Azuma became the first woman to command a warship squadron. “I don’t think about being a woman. I will concentrate my energy on fulfilling my duties as commander,” the 44-year-old said at the time, according to local media. When she joined the country’s maritime self-defence force in 1996, women were not allowed to serve on warships. That ban was lifted a decade ago, but women are still barred from serving on submarines. Breaking through Japan’s male-dominated workplace remains a huge challenge in different fields, such as the corporate world where women face difficulties rising up the ranks. Women are also still banned from competing professionally in Japan’s national sport, sumo wrestling. Despite the prime minister’s efforts to improve the position of women in the workplace, the nation dropped from 111th to 114th in 2017’s global gender equality rankings, according to the World Economic Forum.